I thought this was common knowledge, but after a discussion on twitter, and a subsequent internet search, I think it’s not well known. In Windows 7, and Server 2008 and 2008 R2, you can disable UAC without requiring a reboot. You simply have to log in with the local administrator account and disable it via the User Account Control Settings dialog. Any change made will not require a reboot. Please note, you must use the built in Administrator account… using an account that’s in the Administrators group will not work. It appears that in Windows 8, a reboot is never required, at least I couldn’t get a forced reboot in my testing. If I have time, I’ll update this with testing on a Server 2012 system in a few days. Note, I am not endorsing that one routinely use the built-in administrator account on a system, and I’m not endorsing completely disabling UAC. Both are very real security risks… but there are times when it’s far more expedient to do this in a controlled fashion than the alternatives. I am a firm believer in the policy of Least Permissions Needed. I got a Surface Pro through work, some there are thinking that this might be a good laptop refresh replacement asset. All in all we got almost a dozen and spread them out pretty good among IT. We have some Client Services folks, our “Executive Liaison Group”, our AD Administrator who does way too much with GPO management, myself the DBA, and a couple managers (I know!) with one. I am going to focus on using this as a complete laptop replacement so lets break for a paragraph about that! I’ve had my trusty old Lattitude e6410 since starting at this company, so almost 3 years now. I had the last RC of Windows 8 on it in a dual boot mode, and when 8 RTM’d, I “side-graded” to that release. I say that because I have a blog post on how I did it, and it really generated a lot of traffic for me. I happened to answer another DBA’s twitter post about the possibility of “upgrading” from RC to RTM, he also blogged about it, referenced me and my post, and that got picked up in a Computer World article. That generated around 10k hits last year, and close to that already this year. Boring, I know, but I wanted to point out that I’m already somewhat familiar with the Win 8 “Metro” interface. Even though the Dell isn’t a touch screen, and I immediately found and installed Classic Desktop, I still played around over the past few months with Metro. So, on to the goods. My plan is to hopefully write a weekly entry about how the week was. Today I just bought a plain and cheap Mini DisplayPort -> DVI adapter from Office Max. It is an iLuv Mini DisplayPort to DVI Adapter with the actual note on the bottom of the box “* MacBook Pro and DVI Cable not included”! It was $24.99, but available today, so I grabbed it. It just worked, I was a little concerned about it hanging with all the other elite and ultra-cool Apple gear, but it just works. I have an old 19″ Dell LCD that does 1280 x 1024 and it works, and looks pretty darned good. Next week, I should be getting a mDP -> Dual DVI adapter from Monoprice. Here’s the part an ugly little thing, but at $40, I don’t care. I’ll tuck it up between my two 24″ Dell displays at work, and no one will see it. That’s when the testing will start in earnest. I consider myself a power user, as a sole DBA at this large company, I’ve usually got dozens of windows open and activities happening in the background. Whether it’s powershell scripts to gather SQL Server documentation, fixing Merge Replication crashes, doing new installs, running XPERF to trace down driver/hardware induced DPC’s… I’m doing a lot. 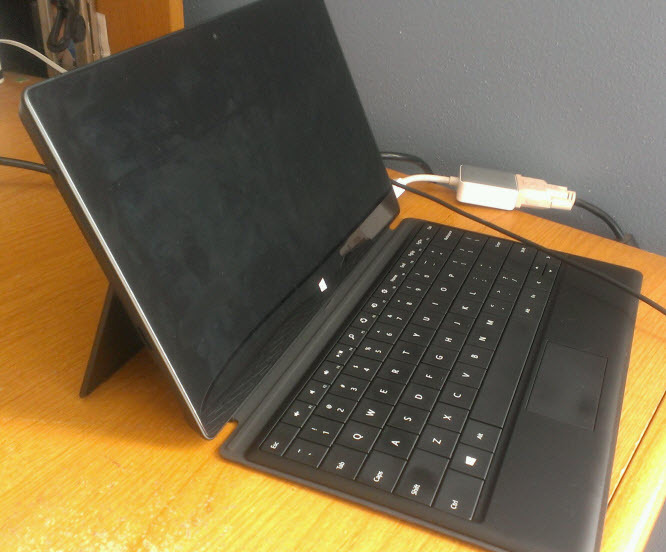 The specs of this tiny little Surface Pro are probably better than my laptop. It’s also got a Core i5 (at least one generation older), 4 GB of memory, a 250GB spinning magnetic drive, and a crappy little display. The Surface is so much better, with a 128GB SSD, latest gen i5, a super-duper-spectacular display, and also 4GB of RAM. I’ll work on some better pictures for next week… and clean the screen!!! eewwww! I have been dabbling and playing in Windows 8 since the first Release Candidate was out. I like it. Of course, on my laptop I have installed Classic Shell http://classicshell.sourceforge.net/ which brings back my familiar Start Menu and Desktop. Metro seems ok for tablets, but for a Keyboard and Mouse setup, it drove me nuts. Anyway, to the meat of the post here… When the RTM was released to MSDN yesterday I downloaded the ISO. I then mounted the ISO natively in my Windows 8 Release Preview install and ran Setup. I tried the upgrade path, the selection was available. After a couple of steps I was presented with the “This is not an available upgrade path, please visit http://noupgradepathforyou for more information”. I decided to try the Windows 7 work around for this. This means mounting the iso in Read / Write (I just copied the already mounted iso to a new folder) and then modifying /sources/cversion.ini. I changed the values of MinClient and MinServer to 7100. I then ran Setup from that folder, and my upgrade was successful. Now, keep in mind, that this is not supported, and could end up with a catastrophic failure if some bits are not properly upgraded. But 12 hours in, and things seem stable.